Happy Monday! Well it’s the start to another wonderful week and I hope you all had a wonderful weekend like I did! My volleyball team did really well in the tournament they played Saturday, the Mr. and I had a wonderful Sunday chilling and doing some shopping (my fav). Since I was in such a good mood yesterday, we decided to cook and try a fun new recipe that I had seen on Pinterest here: grilled avocados with tomato salsa. Cut avocados in half and de-seed. Brush with lime juice and set aside. Combine minced tomatoes and remaining ingredients. 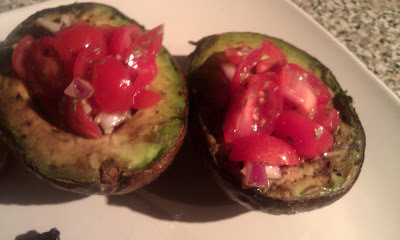 Throw the avocado on the grill for 5-7 minutes open face down. (It started freezing rain while the Mr. was out there so the grilling wasn’t as “clean” as we wanted it to be). You want to be able to see the grill marks on it like my inspiration picture above. Bring them inside and fill the avocado with filling. Enjoy! Some recipes suggested serving these as a spread with crusty bread. We ate them plain and it was delisc. 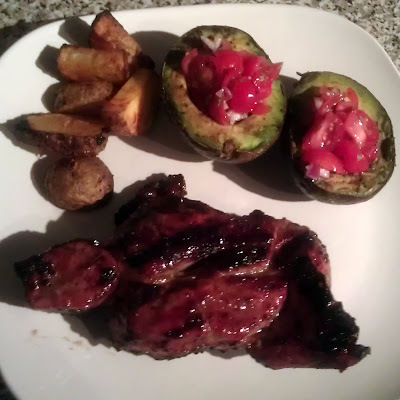 We ended up serving the avocados with some potatoes that I tossed with paprika, garlic salt, and olive oil and some country style ribs that the husband BBQed with some homemade sauce (okay…. so he took Sweet Baby Rays and added a bunch of spices and other seasoning to it… same thing as homemade I think :)). I’m trying a new recipe tomorrow so that’ll be posted next Monday! I’m pumped! Hi! I'm Angie from St. Louis, MO. I am a self proclaimed bargain hunter and DIYer that loves to do home improvement to my house... or anyone's that lets me! I have a good eye for finding potential in the everyday junk that surrounds me. Training, Trails, and 86 in July!